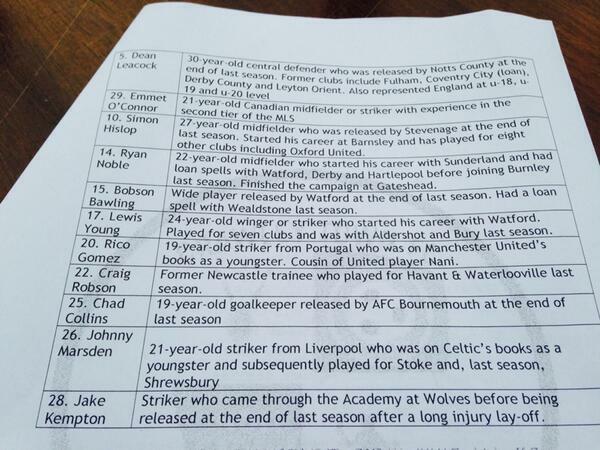 I can imagine a few players who have played with "iron bars around it"
Details of the trialists on show tonight. Thanks Peter some interesting unproven youth and some uninspiring journeymen. That said open mind as we have released players that I believe can do a job. Some players we have seen over the years have only shined in a reds shirt. A couple of the triallists of interest John Marsden (Liverpool Boys) and Ryan Noble (Sunderland), both young strikers who were tipped for great things but where it hasnt quite worked out (yet)? Is that 4 goals in 4 minutes? Are we Germany in disguise? Yeah, funny i had a conv with somebody up here about 3mths ago about John Marsden ............ hope he's good might get some tickets for away games, lol !